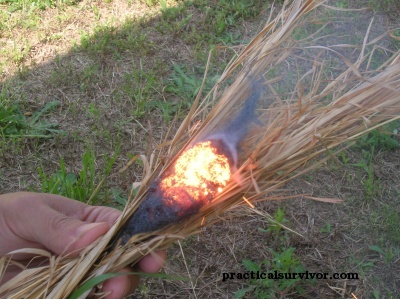 An interesting idea, to start a fire using steel. 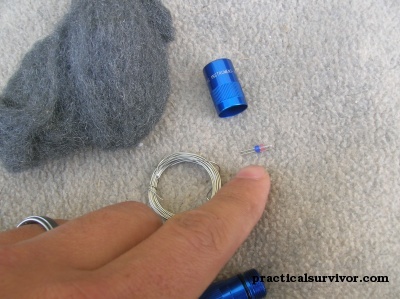 Steel wool is made up of very fine steel strands. Steel wool is usually made from low-grade carbon steel but can be made of other materials such as aluminum or stainless steel. So how do we make steel flammable at such a low temperature? To cover that we must go into ignition temperature. 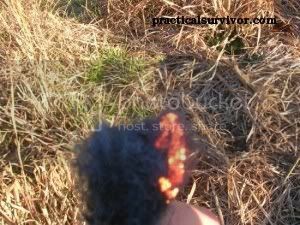 Ignition temperature is the minimum temperature needed to cause a substance to burn. Ignition temperature is controlled by properties such as density, surface area, and humidity. The manufacturing process increases the steel's surface area. 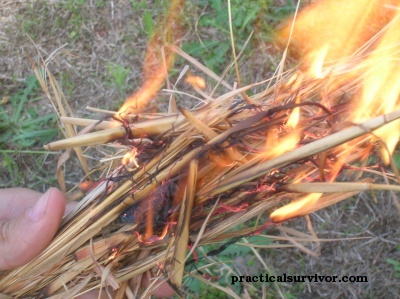 The thin strands are then easily ignited with a spark or current. What this means is we are looking for extra fine steel wool. Steel wool is graded differently in terms of fiber thickness and abrasiveness. The latest scale we found goes from 0000# Ultra fine to #4 Extra Coarse. Click here for #0000 Extra Fine Steel Wool. 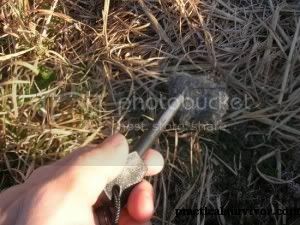 A very small spark will ignite the steel wool. 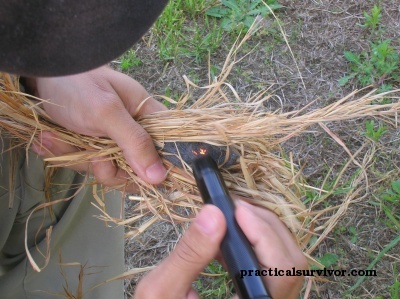 We usually use a ferrocerium rod, otherwise referred to as a firesteel or some people call it a flint rod. 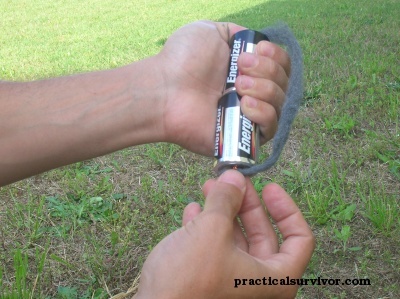 by making contact with an electrical circuit such as a battery or flashlight. 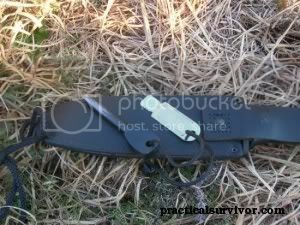 On the left we have Swedish Army Firesteel made out of Ferrocerium. Ferrocerium: a pyrophoric alloy of iron with cerium; used for lighter flints. It is capable of igniting spontaneously in air with the use of friction. This alloy of iron and rate-earth metals is used for tools such as Swedish Firesteel and the Blastmatch. It has been used for the flint in lighters and military tracer rounds. On the right we have the steel wool. As previously mentioned we are using (#0000 super fine) grade. This can be purchased at hardware stores and some department stores in the paint section. Steel wool is commonly used to remove paint, lacquer and polish metals. 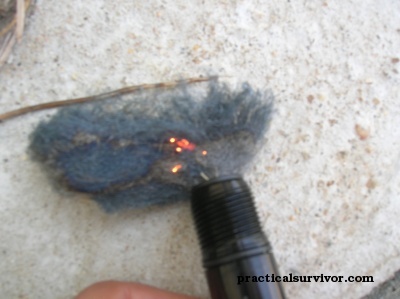 The very first spark from the firesteel causes the steel wool to ignite. 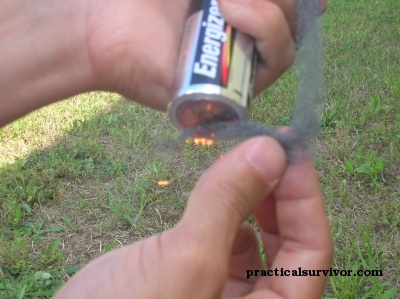 We can place the steel wool with other tinder and start a fire by blowing on the steel wool. Be careful the rapid oxidation of the steel causes small pieces to fall of and can burn your hand. Ignition can also be achieved using current. Contact with an energized electrical circuit will cause ignition. 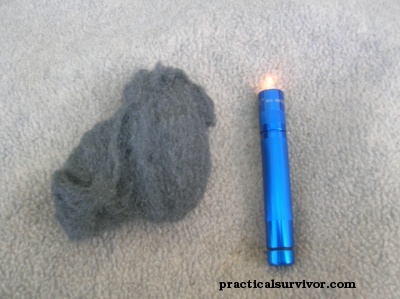 We can use a flashlight, jumper cables or a battery to complete a circuit and ignite steel wool. During our testing we tried using MagLite Solitaire flashlight. We remove the flashlight head and expose the bulb. 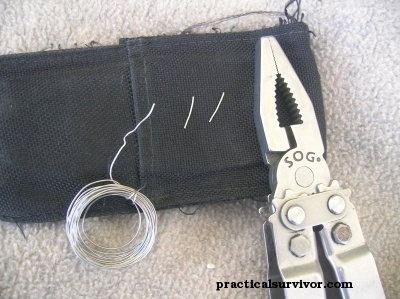 At this point we remove the light-bulb out using our fingers and insert two small pieces of snare wire. 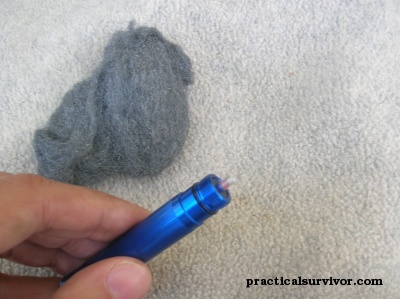 At this point we simply remove the cap of the flashlight and carefully insert the wire without allowing connection. 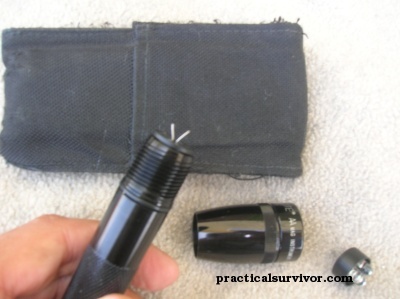 If they connect, they will burn the plastic insert on the flashlight. The current from the Solitaire was insufficient to cause ignition. Looking back, we should have tried with very small strand grouped together. Next we tested the Mini-Maglite. 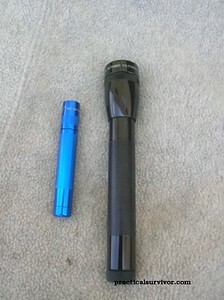 The The Maglite Mini has enough current to get a spark. 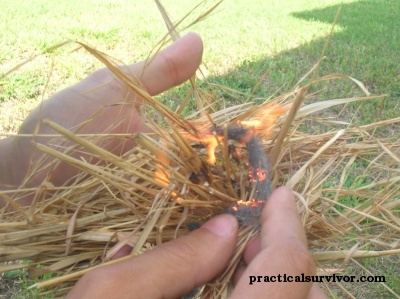 Next we place the steel wool inside a nest made out of dry grass. By blowing on the ignited steel wool, we can get a fire. 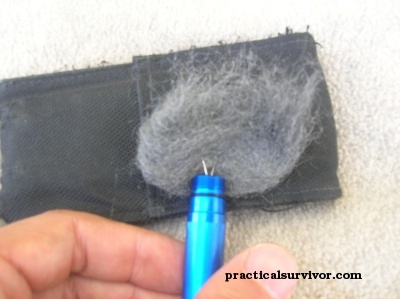 As a final test, we use D cell batteries and steel wool. 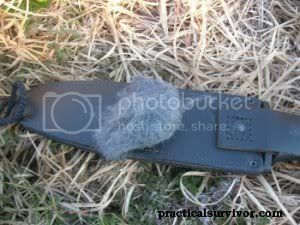 We complete the circuit with the use of a thin piece of steel wool. We place the steel wool in the nest and voilà we have fire. Different size batteries can be used. 9 volt batteries are commonly used due to the positive and negative posts positioning.